En ce troisième jour, nous quittons le désert de Lipez ainsi que la réserve nationale « Eduardo Avaroa » et continuons ainsi notre remontée vers le nord pour rejoindre le Salar d’Uyuni. Sur la carte google map ci-dessous, notre parcours du jour est en vert. Nous longeons la frontière chilienne (sur notre gauche) ainsi que plusieurs volcans que nous apercevons au loin depuis le désert de Siloli. Notre premier arrêt se fait à l’arbre de pierre (El Arbol de Piedra), sculpture de pierre formée par le vent. Tout autour ce sont pleins d’autres roches sculptées suivant le même procédé mais au résultat pas aussi esthétique. Les couleurs autour de nous sont toujours aussi magnifique avec toute la palette des rouges et jaunes qui ressortent. Nous traversons ensuite cinq lagunes successives, toutes différentes les unes des autres. La Laguna Ramaditas, la Laguna Honda, La Laguna Chiarkota, la Laguna Hedionca et enfin la Laguna Canapa qui constituent la fameuse route des joyaux..
De la, nous apercevons en fait pas un mais trois volcans… dont le Volcan Ollague toujours en semi activité , d’ou l’on peut apercevoir des fumerolles sortir du côté gauche. Nous repartons sur la route (enfin la piste) avec comme repère le volcan Tunupa situé au nord du salar d’Uyuni. Au fur et a mesure que nous nous approchons du Salar, le paysage change. Nous traversons un petit salar, celui de Laguani, puis apercevons les bords de celui d’Uyuni. Autour, la terre est propice à la culture de Quinoa qui ne nécessite pas beaucoup d’eau. Nous découvrons notre hôtel de sel où nous passerons la nuit. Nous grimpons ensuite la montagne, juste derrière notre hôtel de sel, de laquelle nous pourrons admirer le couche du soleil avec en fond le Salar. Demain, nous marcherons sur le Salar. We leave before the sunset the Village of San Antonio de Lipez to start our second day of Road-trip. We are going down toward the South-West to almost reach the border of Chili. Our first stop, before the sunrise, is the Pueblo Fantasma or Ghost Village. It is an abandonned village located at 4,650m. Why? Hum… The village has been totaly abandonned in 1960. The official raison was due to toxic gas leakage from the mines. This village has been built following the discovery of gold and silver around it. It became so very rich. Something we can easily see by looking at the size of the main church which is much bigger than any other church in the region. But at the end of the 19th century, miners started to become ill and to die. This is when people started to move away from the village. The exode ends in the sixties when no one was left. At the same time, a new village has been built but further away. All the gold that was in the church got borrowed but never came back. Still some people are angry about it. The village became then the poorest of the whole region. What is the legend behind this? The legend tells that the real responsible was the Devil that they call “El Tio”. This one was leaving above the village inside the mines. Outside God is in charge, but underground, in the mines, El Tio rules. (as we will see in Potosi Mines). As too many people were dying, the priest settle a bet with the devil. The first one who arrives at the summit of the mountain will win. If the devil wins, all the village will belong to him but if the priest wins, the devil will be changed into a stone. And the devil lost, too lazy to get up on time. It got changed in a stone that the priest surrounded with chains. Today, we still can see it, although you need a full day of walk to reach the top of the mountain. For the local, the belief is strong, and not a lot of people tries to come down to the village. Too many bad things used to happen. After this stop, we reach our highest point of the entire trip. 4,855m at the Laguna Morejon. We have a bit of headache, it is cold outisde, but we are still smiling for the picture. Then we enter the National Reserve of Andina Fauna « Eduardo Avaroa » which includes all the south part of Boliva between Argentina and Chili. and the Suris, ostrich cousins that we call ususally Darwin’s Rhea, which near threatened species. We were supposed to go further south to reach the Laguna Verde but a recent earthqauke change the water color from green to brown. No worth going there anymore… (the way back is 2 hours at least). The landscapes around us are still amazing. Every hill we drive up, it changes. We spend the lunch break at the hotsprings (Las termas) where we having our first “shower” since the start of the trip. The afternoon plan is quite simple but spectacular. We can admire a lunar landscape with plenty of holes from where fumes of sulphur escape. We can hear as well the noise made by the bubble of air bursting from the boiling water (or liquid). Even if around these holes the temperature is quite good, overall, it is windy and cold. We can easily forget that we are at 5,200m as there is no view point like you would have from a summit in Nepal. We end up the day with the most beautiful laguna, the laguna colorada which is red. That is it for our second day, as great and exciting than the first one. We say our goodbye with a short photos gallery which summarises our second day of road trip in South Bolivia. We left Salta for two days of road-trip (the south Loop for those who know) to discover the back garden between Argentina and Chile. We managed to find a third person (our friend Alejandro from the same hostel) with who we rent a car for 300 Pesos per day (around 56$ per day). It was the smallest and cheapest car we even found. On the first day, we went down through the Las Conchas Valley to reach Cafayate, located 190km south of Cafayate. The landscape of this particular valley changes dramatically. After leaving the plain of Salta and it surrounding villages, we enter the Conchas valley from a very narrow part. The blue sky, ochre earth and trees standing at the bottom of the valley make me think we are in Morocco. But you need a quick glance around to realize there is thousand of cacti around you. Yes, we are in South America, and it feels good. The valley is getting wider little by little. And this is when we arrive at the first tourist attractions. The devil throat or La Garganta del Diablo (a name we have heard a lot since we have been to the Victoria Falls and Iguazu fals) and the amphitheater, two amazing rock formations. View from outside to inside of the Devil Throat. We continue our journey through the valley which keeps widening. We left Salta around 10 am and it is nearly 5pm.. The valley opens up into a plain of vineyard that surrounds Cafayate. The city of Cafayate belongs to the wine road in Argentina (we haven’t done it but I recommend to do it). Located at 1683m, the landscape around it, locked between the mountains and the cacti, is particular. On top of this, the contrast betwween the cactus and the wineyard is irreal. For someone who is use to the french vineyard or even the australian one (hunter valley) this is new. Cafayate is a touristic city that deserves to be seen. Donkeys in the street, what’s else? The next morning, we going back to North but not directly to Salta as we head first to the traditional village of Cachi. We will drive the Road 40, very famous road that cross from south to norh Argentina. This road will lead us through the valley of Calchaquies. Less red and ochre than the Conchas valley, it doesn’t mean it is not as spectacular. The little village of San Carlos and its little Church made of adobe. The valley of Las Flechas (Valley of the arrows) where stone and mountains point toward the sky, looking like arrows. The view point of Angastaco as torn as the valley of Las Flechas. Finaly we arrive in Cachi, a bit disappointed by it. We visit the cemetery from where the view is splendid. (Why do you need to die to deserve the best view !!!). From Cachi, we turn toward the East and start our return to Salta. But we not yet there. The road brings us to the National Park of Los Cardones quite famous for its straight road of a 18 kilometers called « La Recta TinTin ». Why this name ? The road is indeed an old pre-hispanic dirt road. The name of Tin tin comes from the name of the river, the Tin tin rio, that throws himself into the Calchaquies valley, next to Cachi. The car easily climbs to 3000m… Here, the landscape is only cactus, we love it. After a few kilometers, the first turn, but we keep going up to reach the pass at 3347m. This is San Piedra del Molino. Amazing view with the sun going down. From there, we start our descent to Salta into a new valley. The light of the sunset helps us to get some nice shoots. Arrived at the hostel, we wash the car in the dark as we need to get it back fully cleaned. After these great two days, we end our trip at the local restaurant, El viejo jack (The old jack) to taste some amazing and cheap argentinian meat. That is it for our road trip around Salta. We won’t do the north loop as it requires for some parts a four Wheel drive which doesn’t fit our budget. From Salta, we will take a bus straight to Boliva, the country of Evo and the coca. There, we will discover a lot of new things.We do travel without book guide as we find it more fun to ask feedback to other travellers on where to go, what to do. This is the freedom of travelling for such a long time…As well, we found that any hotel or restaurant quoted in these guides will price 20% to 50% more than the other for the same service. Blog you soon from Bolivia. Nous avons pu loué à trois (avec notre ami espagnol Alejandro rencontré à l’hôtel) une voiture (la plus petite et la moins chère possible) pour 300 Pesos Argentins par jour soit 44 euros par jour. Le premier jour nous descendons à travers la vallée de las Conchas pour rejoindre Cafayate, situe a 190 km depuis Salta. Les paysages de la vallée de las Conchas changent continuellement. Après avoir quitté la plaine de Salta et les quelques villes avoisinantes, nous nous engageons dans une vallée assez étroite. La terre rouge sans végétation, le ciel bleu pur ainsi que les arbres qui ne sont qu’au niveau de la rivière rappelle le Maroc. Mais les bref coup d’yeux aux alentours permettent de réaliser qu’il y a beaucoup de cactus et que nous sommes bien en Amérique du Sud. La vallée s’élargit au fur a mesure et c’est à cet endroit que nous arrivons aux points touristiques. La gorge du diable, (Garganta del Diablo) et l’amphithéâtre, deux formations géologiques assez intéressantes, formées par les éléments, notamment l’eau. Nous continuons notre chemin et la vallée continue à s’élargir. Après le point de vue des trois croix (Los tres creces), nous arrivons à l’obélisque, puis les châteaux (Los Castillos). Nous en profitons pour faire un stop à un point de vente d’artisanat local, non pas pour acheter, mais pour s’amuser avec leur lama accroché au bout d’une corde. Bref, la vallée se termine en beauté dans une plaine de vignes où nous arrivons sur Cafayate. Cafayate est une ville qui fait partie de la route des vins (que nous n’avons pas fait, mais qu’il faut faire). Situé à 1683m sa particularité est ce paysage de vignes magnifique coincé entre les montagnes et les cactus. Le contraste entre les vignes et les cactus est spectaculaire, surtout quand on est habitue à ce que l’on voit en France ou même en Australie dans la Hunter Valley. Cafayate est une ville très touristique mais très jolie qui vaut le détour. Le lendemain, nous remontons vers le nord direction le village pittoresque de Cachi en empruntant la fameuse route 40 qui traverse l’Argentine du Sud au Nord. Route qui traverse donc une autre vallée, celle de Calchaquies. Cette vallée beaucoup moins rouge que celle de la veille, n’est pas moins magnifique et spectaculaire. La vallée des Flèches (Las flechas) où tous les rochers et pierres pointent vers le ciel tels des flèches prêtes à être tirées. Le point de vue d’Angastaco, aussi tordu et penché que les rochers precedents. Enfin arrivés à Cachi, village avec un intérêt moyen, nous tournons à l’est et amorçons notre retour sur Salta. Sauf que la route n’est pas finie. Nous traversons tout d’abord le Parc National de Los Cardones connu par sa fameuse ligne droite de 18 kilomètres « La Recta TinTin ». Pourquoi ce nom ? La route emprunte en fait le trajet d’un ancien chemin préhispanique. Le nom de Tin tin vient de la rivière, le Rio Tin tin, qui se jette dans la vallée Calchaquies à proximité de Cachi. Nous sommes montés à 3000m et le paysage est toujours aussi rempli de cactus…. On adore. On en profite pour faires quelques photos sur la route. De là, la descente jusqu’à Salta se fait en douceur. Voilà pour notre escapade de deux jours autour de la région de Salta. Nous voulions faire la boucle du nord (aussi magnifique), mais il est recommandé d’avoir un 4×4 pour certaines parties de la route. Chose qui ne rentrait pas dans notre budget d’un an de tour du monde. Iguaçu ou la revanche continentale du Sud sur le Nord !!! Et oui, il faut croire que les Chutes d’Iguaçu sont exceptionnelles et beaucoup plus spectaculaires que celles de Niagara. Voilà donc quelque chose donc deux pays d’Amérique du Sud peuvent se narguer d’avoir beaucoup plus grand et large que les Etats-Unis. Les chutes Iguaçu ont été découvertes en 1541 par le conquistador espagnol Alvar Nunez Cabeza de Vaca. Tout comme les chutes Victoria, des tribus habitaient ici bien avant que les européens décident d’y mettre leur pied et d’en faire ce qui est aujourd’hui un énorme business avec plus de 1.2 millions de touristes chaque année dans la partie argentine. Pour le côté scientifique de la chose, les chutes d’Iguaçu ont été formées à la suite d’une éruption volcanique qui a laissé une crevasse géante. Il y a 275 différentes cascades qui plongent dans la gorge. En terme de comparaison avec les deux grandes autres chutes connues (Niagara et Victoria), Iguaçu est la plus grande même si le record de la plus grande chute d’eau en elle-même est détenue par les chutes Victoria tandis que les chutes Niagara ont un débit impressionnant de 2400m3/s alors qu’Iguaçu n’a que 1746m3/s en moyenne. Nous sommes enfin donc en Amérique du Sud. En ce samedi 30 mars, nous débarquons en fin de soirée à Sao Paulo de notre vol transatlantique depuis Johannesburg. Une nuit passée à l’aéroport, une matinée à attendre au terminal de bus et enfin 16 heures assis dans un bus brésilien, nous voilà arrivés à Foz de Iguaçu, côté Brésilien donc. Cinq minutes plus tard (on perd pas de temps) nous revoilà dans un autre bus en direction du parc National d’Iguaçu. Le temps de se débarbouiller (presque 2 jours sans se laver), de laisser nos énormes sac à dos dans une consigne (bien pratique), nous voilà dans un troisième bus qui nous emmène de l’entrée du parc au point de vue sur les chutes… Nous ne comptons passer que quelques heures sur ce côté des chutes étant donné qu’il est bien moins spectaculaire que son voisin argentin. Nous faisons le chemin des chutes (Cataratas Trails) puis descendons au balcon de la gorge du Diable, où le bruit assourdissant de l’eau se mêle à celui des touristes criant et se poussant pour prendre sa modeste petite photo souvenir… Et nous avons fait la même chose… Que celui-ci qui ne l’a pas fait, lève la main.. (je ne vois personne) et oui, nous sommes tous des touristes, et il faut croire que la course à la photo souvenir est au touriste ce que la conquête du graal était à Indiana Jones. Voici une petite galerie de notre journée sur Iguaçu côté Brésilien. Le lendemain, nous remettons le couvert mais cette fois-ci du côte argentin. La veille nous avons traverse la frontière Brésilienne ce qui débute notre aventure sud-américaine. De Port Iguaçu, nous prenons le bus pour arriver aux portes du parc national. De là, un gentil petit train (on se croirait à Disney Land) vous amène à la station des Gorges du Diable… Pourtant on a pas vu Mickey..
De la, nous marchons sur une passerelle longue de 1.1km qui nous amène jusque dans la gorge du Diable. Le Diable doit justement être en train de se gargariser… Mal de gorge, je sais pas, mais il avait l’air malade. Il y a beaucoup d’eau et le nuage d’eau poussé par le souffle nous éclabousse… Nous nous sommes faits donc trempés. Je termine cet article avec une petite filmographie des chutes Iguacu. – OSS 117 : Rio ne réponds plus (2009) avec notre fameux Jean Dujardin national. Notre prochaine étape se continue en Argentine avec la visite de la ville de Salta dans le but de nous rapprocher de la frontière Bolivienne. 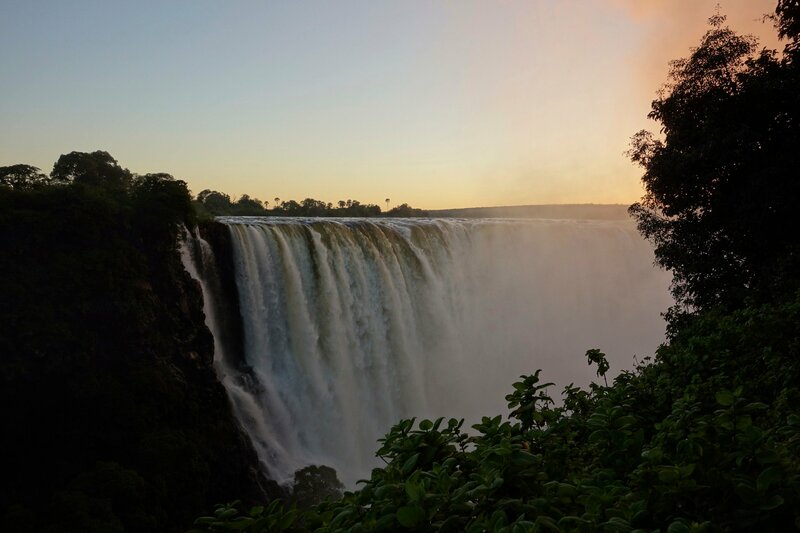 Sunrise on the Victoria Falls in Zimbabwe. After our safari into Chobe NP, we leaving Kasane (still in Botswana) on Friday the 29th of March to cross the Zimbabwe border and end up in Victoria Falls city. We final arrive to the last part of our 10 days trip with Gecko’s. For me, it will be the first time I see such massive falls whilst Caroline has already been to Niagara falls. 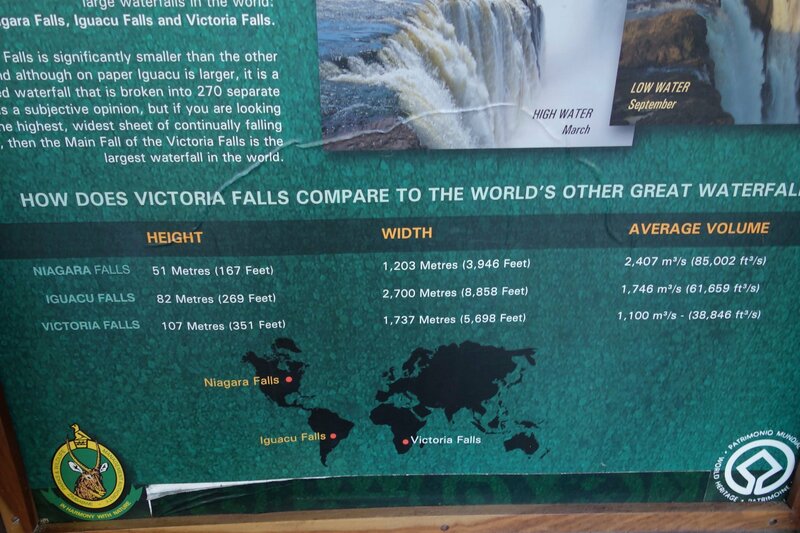 Firstly a bit of history and fact about the Victoria falls. The first european to discover them is Jonathan Livingstone, a scottish missionary and explorer, on the 16th of november 1855. 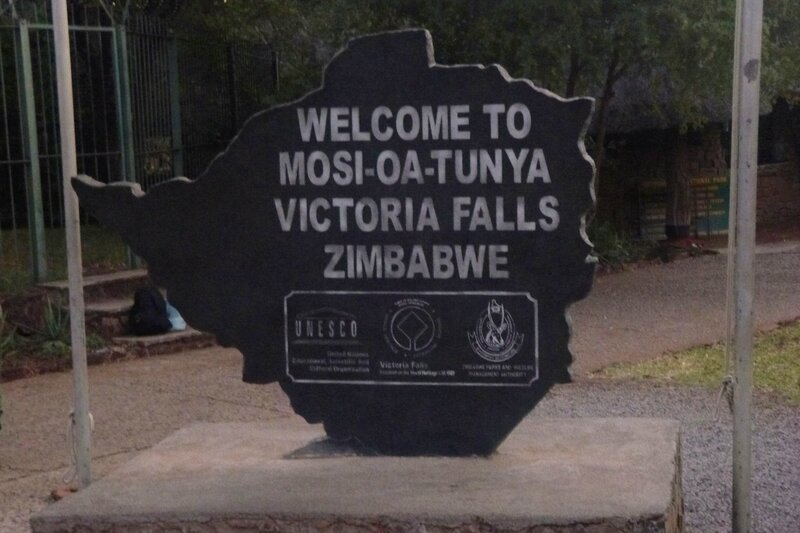 The name of Victoria falls is given in honour of Queen Victoria while the indigenous name of Mosi-Oa-Tunya means “the smoke that thunders”. So, which one is the largest and highest in the world? Iguazu between Argentine and Brasil, Niagara falls or Victoria Falls. Neither they are the largest nor the highest waterfalls of the world. But when you consider the width of 1,702m and the height of 108m, it is in fact the largest sheet of falling water in the world. From a water point of view, the water can be sprayed up to 400m high and sometimes up to the double. This means that the could of mist can be seen from 48km away. We end up the day at the pool bar of the camp site then went eating at the restaurant where our group has gather for the last time. Anyway, before catching the planes we have a few hours to wake up early and run to the Victoria Falls to admire the sunset. When we get there, it was still not open because the staff was late… They finally arrived although didn’t apologize for being late. 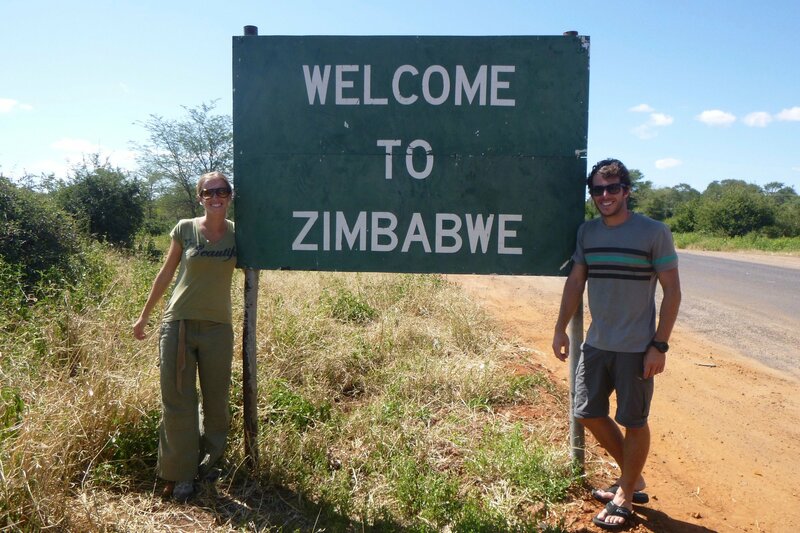 A few hours later, we say goodbye to our group and take the road toward the border and Livingstone in Zambia. Already when we check-in,we start to speak spanish (I kind of try while Caroline couldn’t stop her speaking). We met a Family from Mexico and a Columbian couple who is living in Brisbane in Australia. It is as well where I receive an email from Pierre and Roxane, a couple with their kid who are travelling currently in South America. Pierre asked me some questions about Asia, their next destinations. Looking at their website (www.allonsvoirailleurs.be) I found they met another french couple and their kid :Axelle, Vincent and their baby Camille in Chili. I know Axelle and Vincent from our university in France (Ecole des Mines d’Ales) and they live in New-Caledonia (not far from Australia). The world is so small. This is it… This is the end of our short aventure in Africa and it is time to reach South America. We know one thing. We will be back with more time to explore deeper this marvellous continent.